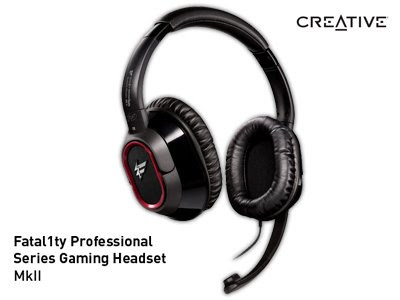 Here's one interesting fact about the new Creative Fatal1ty Professional Series Gaming Headset Mk II. Repeat the name twice and you will almost reach the 140 word limit in Twitter. Having said that, damn, this is one fine looking gaming headset! We first saw this during CES where Creative introduced the Silencer Technology to the world. Many months and some minor design improvements later, the headset is re-branded into the Mk II with a price tag of US$99.99. I would see why a gamer would be inclined to buy this however, for the rest of us, the need for a Sound Blaster X-Fi Titanium series sound card to utilize the Silencer Technology might just break the deal for us. As we haven't had the chance to test out the headset, we can't comment on how good or comfortable it is. But if you're a fan of Fatal1ty or gaming, i think this is a pretty decent buy at a $99.99 price point. Pre-order it today at us.creative.com.